Last week, Taghreed Jaber, Regional Director of PRI’s Middle East and North Africa (PRI MENA) office, and Yemen’s Prisons Director, Major General Mohamed Ali Alzelb, signed an agreement of cooperation for an initiative to protect vulnerable groups in Yemeni prisons and to provide training for Yemeni prison staff. 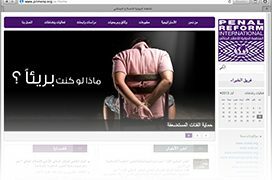 The initiative is part of a wider project covering six countries in the Arab region, which aims to protect vulnerable groups in prisons and ensure that international human rights standards are respected in the region’s prison systems. The training programme will start next month. After the signing, Major General Alzelb stressed the importance of training to address the lack of basic knowledge regarding the treatment of prisoners and about programmes of rehabilitation and reintegration, and the importance of cooperation in this area. While in Yemen, the PRI delegation had several other fruitful meetings. The delegation met with the Yemeni Minister of Social Affairs, who stressed the importance of cooperation between the Yemeni government and PRI. He also expressed the Ministry’s readiness to cooperate with PRI on addressing children in conflict with the law through raising the age of responsibility as adults before the law from 15 to 18, respecting the Convention on the Rights of the Child, and building the capacity of institutions working in the field of juvenile justice. The delegation also met with Minister of the Interior, who gave his blessing to the reform efforts for children in conflict with the law, and to ensuring that prison practices in general protect the dignity of citizens and facilitate their reintegration into society. The Minister said that prisons in Yemen are facing major problems and a lot of work was needed to resolve them, identifying in particular the need to improve prison conditions, address overcrowding and alleviate poor nutrition, health and education. Finally, the delegation had a meeting with Judge Hala Qurashi, Deputy Director of the Technical Office/Project Liaison Officer of the Yemeni Ministry of Justice on how to coordinate with PRI in reviewing legislation in Yemen.